Designed collaboratively by Devon-based illustrator Jane Foster and renowned ceramicist Keith Brymer Jones, this quirky mug features a bright yellow lion on a contrasting white background. Crafted from the finest quality porcelain, this contemporary lion mug is unmistakably one of the Jane Foster animal heads family. Using thick black lines and eye-catching primary colours, Jane’s bold designs appeal to both children and adults alike. Living in a unique, minimalist house on the Devon coast, Jane Foster takes inspiration from 70s and Scandinavian design. Many of Jane’s distinctive designs started off live as a screen print before they were transferred onto stylish ceramics. Dishwasher and microwave safe, this lion mug is a quirky edition to your mug collection. With a slightly smaller mini mug capacity of 225ml, it is the perfect size for an at home coffee machine. 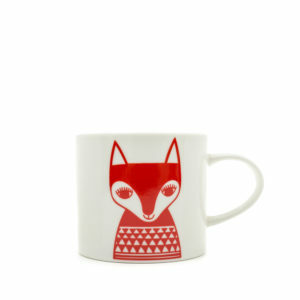 Striking enough as a standalone mug however stunning accompanied by the other Jane Foster animal head mini mugs and standard sized mugs too.